Favara is a city of Sicily, Italy, which is renovating its historic centre. Currently, visitors from all parts of Italy and Europe are visiting to see the cultural revolution and urban regeneration which is changing the beautiful city of Favara thanks to Farm Cultural Park. 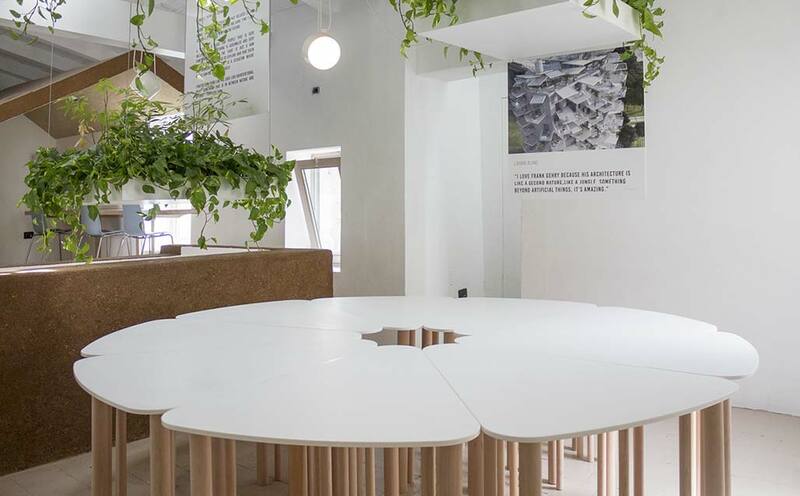 The architects and professors of Polytechnic University of Milan, Marco Imperadori and Andrea Vanossi, in collaboration with PORCELANOSA Italy and KRION Solid Surface, have created the non-profit project for the SOU Children’s Architecture School, which provides children and young people who visit its facilities in their free time with a dynamic, nurturing learning environment. The company Legnoarreda di Butera Angelo, with headquarters in Favara, has transformed the sheets of KRION K-Lifeand installed the project which once completed consists of one hundred and seventy eight wooden legs, supporting nineteen individual tables, or assembled as two collective tables, made with KRION K-LIFE.